South Korean third baseman Hwang Jae-gyun has been designated for assignment by the San Francisco Giants, a report claimed Friday. 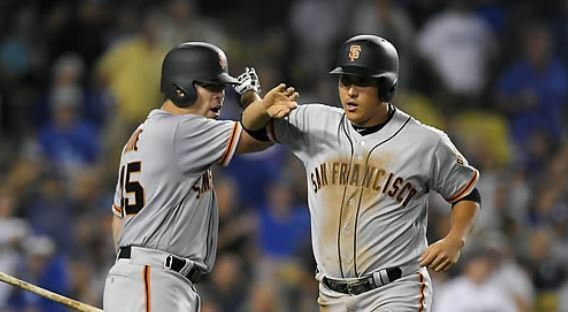 The San Francisco Chronicle said the Giants removed Hwang, their Triple-A third baseman at Sacramento, from their 40-man roster to clear a spot for catcher Tim Federowicz. Major league rosters expand from 25 men to 40 on Sept. 1 every year. Hwang must now wait and see if any other team claims him off waivers over the next seven days. If he clears waivers -- meaning, if no club picks him up -- he may be released by the Giants. The 30-year-old has had two stints with the Giants in his first US season. He homered in his very first big league game on June 28, but ended up batting just .167 in 13 games before getting demoted to Triple-A. Hwang was called up six days later, but batted .125 in six games and was sent down again. In 18 games with the Giants overall, Hwang has a .154 batting average with a home run and five RBIs. In Triple-A, Hwang batted .288 with 10 home runs and 55 RBIs in 95 games.